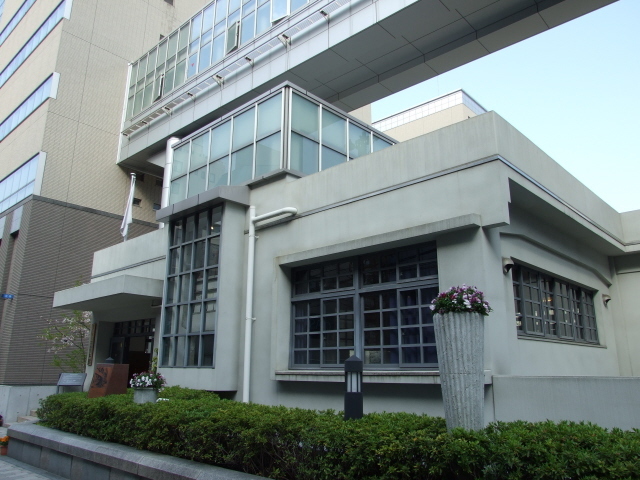 The preserved section of a school building that was exposed to the A-bombing of Hiroshima. 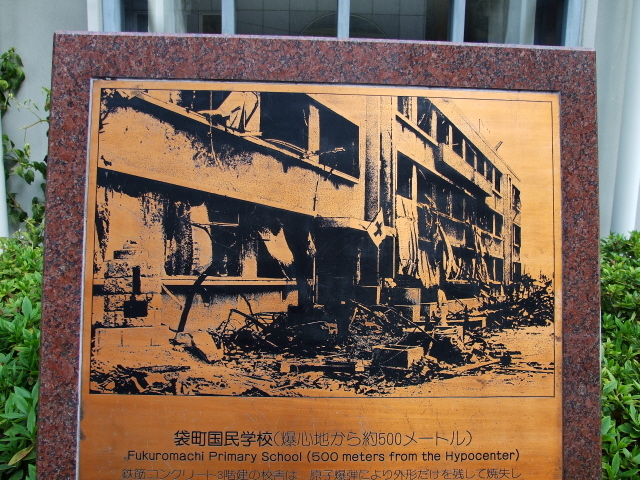 Only about 500 yards (450m) from the hypocentre (the second closest school after Honkawa school) most of the school was destroyed by the blast and fires, only the shell of the west building, made from sturdier reinforced concrete, remained standing – though nearly all inside perished. Only three pupils miraculously survived, because they happened to be in a sheltered part of the basement at the time of the blast. After the bombing, the school's concrete west building served as an important relief station, where survivors were treated as best as was possible under the circumstances. It also acted as an information centre – survivors left notes here about their or others' whereabouts so that relatives could try and reunite. Some of those messages are displayed in today's museum, which opened in 2002. The rest of the building is gone, replaced by a modern school building. What there is to see: The prime exhibit is some of those original scribbled messages left by survivors in chalk on the soot-blackened walls of the staircase. The messages were plastered over after the war but rediscovered when the plaster layer was stripped off. It was decided to preserve this rare piece of evidence of this aspect of the atomic tragedy of Hiroshima. 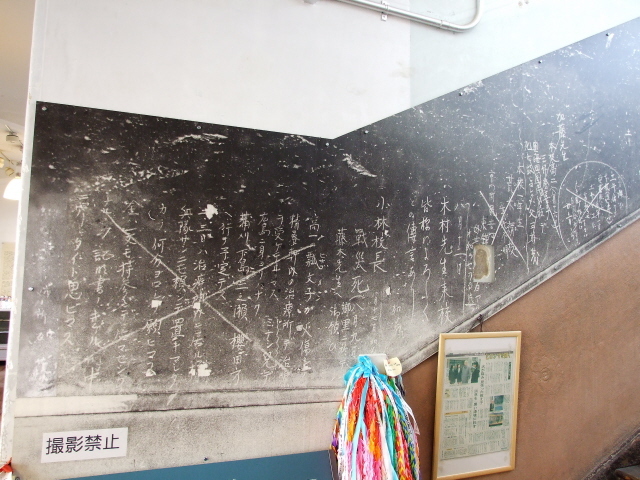 The original markings on the wall are actually very small, but are surrounded by a blow-up of a photo taken at the time (which is also displayed at the Hiroshima Peace Memorial Museum) to give you a good impression. There are traces of other markings discovered when a blackboard was taken down. Downstairs in the basement two doors with windows that were damaged but more or less withstood the blast are on display. There is also a Taiko drum said to have been blown into the schoolyard by the blast, and a slab of concrete with carbonized traces of wooden beams within it, as another illustration of the intense thermal rays of the bomb and the fires it caused. Text panels, in Japanese and English translations (of good quality), provide information, including excerpts from the testimonies of the survivors. The basement section also has a large TV screen on which a 12-minute video is shown – a version with English subtitles can be selected by pushing a button. Upstairs there are the typical displays of colourful paper cranes and peace messages by schoolchildren. On the other hand, of the two school museums Honkawa is the darker site, thanks to its large basement diorama and the bare dark concrete walls (and absence of other visitors much of the time). The museum at Fukuro-machi seems more polished and brighter. Both are equally worthwhile additions to a visit at the main Hiroshima Peace Memorial Museum in the Peace Memorial Park, however. At the entrance a short leaflet in English is available (free) with a few photos, some quotes and a timeline. Location: in central Hiroshima, just behind the former Bank of Japan building, a couple of bocks south of the Hondori shopping street. Access and costs: easy to find and free. Details: Within easy walking distance from the Peace Memorial Park, A-Bomb Dome, or the main shopping district around Hondori. From Hondori or from the Peace Boulevard walk down/up Reji-dori to the distinctive former Bank of Japan building and turn into the side street branching off east at the building's southern corner, carry on past the Rai Sanyo Kyoshitsu/Shiseki garden/museum (with its miraculously recovered A-bombed tree) and turn left at the next corner. You will already see the big new school building. A few yards north you'll get to the preserved section of the old building, huddled under an imposing modern bridge-like part of new buildings. The entrance to the museum is clearly marked. There's no admission fee. You're merely asked to take off your shoes at the entrance and leave them on the shelves provided (as at a private Japanese home or a ryokan – because of the polished wooden floors). Opening hours: the usual 9 a.m. to 5 p.m., daily, closed 28 December to 4 January. Time required: about 20-30 minutes should be adequate, plus 12 minutes for the video. It's not a big place. Combinations with other dark destinations: see Hiroshima.